Everything you need to create espadrille shoes for yourself and your child in one beautiful package! This kit includes your choice of stunning, lush fabric! The Espadrilles MY FEET & YOURS Kit is perfect for getting you started making your favorite little person their own shoes to match yours. It's also pretty enough to give as a gift to a new mama. It's such a fun project for a birthday or Mother's Day gift for a crafty mama (or papa!0. This kit includes needles, espadrille thread, wax, needle puller, elastic, the necessary fabrics and interfacing, an instruction booklet, pattern, and shoe soles. I hand sew many of the kit accessories and include my own adult and child booklet with fitting tips, a how-to for the classic reinforced toe as well as step-by-step instructions. Just pick the shoe size and choice of stunning, unique fabric. Please leave a note if you would like an alternative color of yarn thread. I automatically include the bone-colored thread as it is classic but you can request from blue, black, white, pink and red if you would prefer. Note: This project does require a sewing machine and knowledge of how to sew. The ME AND YOURS kit includes a choice of the following fabrics. Please be sure to MAKE A NOTE of your fabric choice. Every fabric is paired with an organic cotton that I have personally selected because it looks good with the fabric on the outside of the shoe. I use all Cloud 9 Fabric cirrus solids in either Twig, Ocean or Midnight because they are super soft, yard-dyed and fully organic. Great for housing your toes. :) Please leave a comment if you would like to specify your lining fabric and I will make sure to include your preference. Having a hard time choosing the size? I know that sizing can be tough, please refer to each size chart for more information. Measure in inches, as straight as possible, from the heel to the top of the big toe. I am super happy with my supply kit! 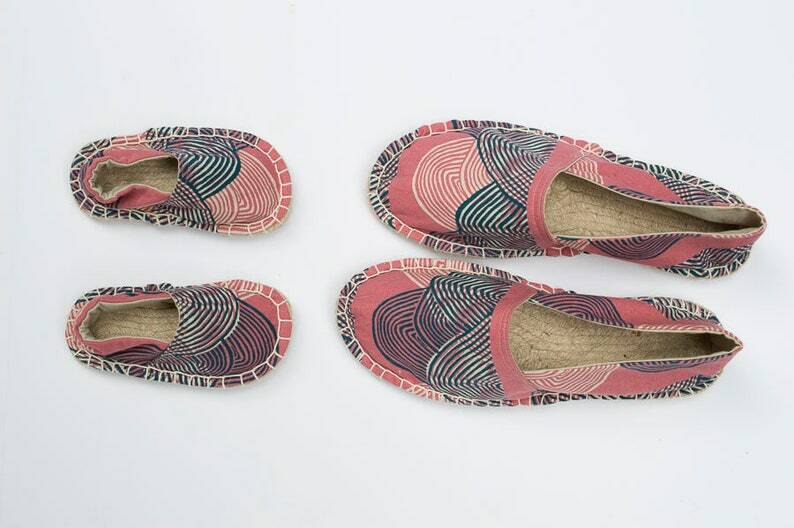 I am looking forward to being able to create espadrilles that stand out and are unique to my style. I love how A Happy Stitch allows you to purchase different variations of kits, just supplies, supplies with fabric, or supplies, fabric, and soles. Shipping was very fast and the packaging was top notch and very thoughtful. The handwritten note, recyclable materials, branded packaging, etc. Just an all around wonderful experience! !